Have you ever been mentored? I mean really mentored? That means someone takes you under their wing and then coaches, guides, counsels, trains and leads you forward. Could be in sports, in music, in business, in spiritual matters, in life. In most instances this mentoring is done one-to-one between two men or between two women. Usually a seasoned person mentors a younger one, passing along wisdom, experience, advice, education and encouragement. And it’s good for the mentee as well as the mentor as both benefit from the sharing, emotional connection, and feelings of helpfulness and being helpful. I have been fortunate to have been mentored and have been privileged to be a mentor to others in various areas of life. We all should seek wise mentors as well as seek ways to become a wise mentor to others. But that’s not the focus here today. I want to address a different type of mentoring: spiritual mentoring and the mentoring of your spouse. This is the problem. That Christian men typically take a passive role in driving spiritual growth in the family. Or that Christian woman want desperately to be led by their husbands, but aren’t. So they push the issue and drive a wedge between themselves and their husband. So men check out. And women give up. And each side retreats to their own busy corners of obligations of work, play, children, friends, and sports. Even church, and covenant groups and Bible studies. And the Kingdom doesn’t advance. And our marriages don’t advance. And the powerful, negative implications on our children and our children’s children are profoundly yet silently played out. In Ephesians 5:22-33 the Bible clearly states that wives are to submit to their husbands as [they] do to the Lord, and husbands are to love their wives as Christ loves the Church. This is not to say that both the wife and the husband cannot have a significant influence on the spiritual development of each other. Strengths – know what your spouse is really good at, their core wheelhouse strengths that shine and come so natural to them. This is God-given and humanly developed. It’s a great source of assurance and confidence. Weaknesses – know their real vulnerabilities, the soft underbelly that is such a source of pain, angst and fear. Often the spouse is the only one that knows the depths of these weaknesses. If a friend knows more, then intimacy can be missed or lost. Opportunities – know where your spouse can shine and be successful. Determine to help them see the possibilities and potential to rise up out of holes and depths of despair. Sometimes you are the only one that can see the forest through the trees, i.e., you have the perspective to help your spouse see beyond the gritty details. Threats – know the key points of exposure, both in people and situations. Be the safe one, one who protects, shields and covers. Yes, a wife can do this for her husband. Certainly the husband should make the world safe for the bride of his youth and help navigate waters to safe harbors. Love Your Spouse – of course, each husband and wife should love his/her spouse with all of their being. We’re all told to love the Lord God with all our heart, soul, mind and strength. (Matthew 22:37, Mark 12:30, Luke 10:27) As men are to love their wives and woman are to submit to and respect their husbands, is this not really submitting and loving each other with all of our beings? Heart, mind, soul, and strength. Why are you holding back? Job #1 for Men: Love your wife. Show it lavishly, express it thoroughly, and repeatedly. And again I say repeat! Job #1 for Women: Respect your husband. Women, men feel it when you honor and respect them. It’s like telling them you love them, without the words. Lead Your Spouse – by this I mean in very practical and tangible ways we can direct, guide and lead our spouse without resentment, rancor, or spite. Spiritually – your spouse needs encouragement spiritually. Pray with them. Pray for them. Get on your knees and hold them up in earnest prayer for strength yet submission to the Lord God. 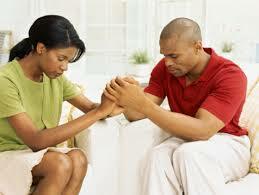 Pray with power and authority and you can melt the heart of your spouse while modeling spiritual maturity. Financially – help the other one manage money. What could be such a source of pain and worry can be a source of repentance and submission to each other, and surrender to God. Take the burden off either party and take this burden before God in humble relinquishing of control and power. Socially – the world can be cruel and lonely. Be a safe haven for you spouse, sensitive to avoid and advise on social situations that will hurt and destroy heart and well-being. Seek healthy mutual friends and scout out unsafe wolves in your midst. Be each other’s protector and best friend. You both, and God, can make a powerful team. I’m still learning how to be wise counsel and best friend to the wonderful wife of my youth. Likewise for her to understand the triggers and soft-spots of her very human husband. We got better at all of this over time, and surprise ourselves with the opportunities to improve. Goodness, we didn’t really start praying deeply for each other until deep into our marriage. We have grown and learned so much from our advances and losses. And God has always been there, we just sometimes didn’t bother to notice or include Him. Yes, we’re learning that mentoring your spouse takes a lifetime to master. And it’s best when the Master is at the center of your marriage mentoring. Are you a Spouse Mentor?